At a rally in Annandale, Virgina, Hillary Clinton delivered an uncomfortable joke about Pokemon and voting that your mom is sure to love. “I don’t know who created Pokemon Go,” Clinton said, “but I’m trying to figure out how we get them to Pokemon Go to the polls!” The crowd, ostensibly filled with women just like my mom who appreciates pop culture references that make her relevant to her kids, went wild. But, like your mom’s jokes, it was weird and awkward (but hey, at least mom is trying!). It looks like Tim Kaine, Virginia Senator who is widely rumored to be on Clinton’s short list, loved the joke. Look at his big smile. Kaine also spoke some Spanish and delivered his a few of his own one-liners, worthy of dads everywhere. “Do you want a ‘You’re Fired’ president or a ‘you’re hired’ president?” Kaine asked the crowd. Mom and dad really brought the jokes today. Meanwhile, Donald Trump, your unpleasant uncle, also tried to include himself in the fun. 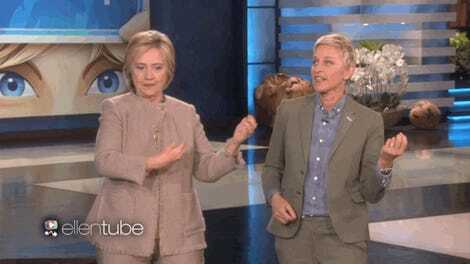 Does Hillary Clinton Playing the Air Guitar Make You More or Less Into Her Policies?